Beginning Monday, May 6, 2019, at 10 AM, the Black Swan Yacht Club (BSYC) will begin its spring boating season at Lake Charles. 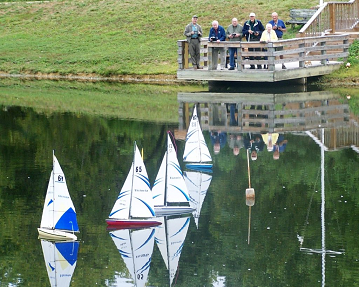 The opening day’s activity will consist of a brief explanation of how radio-controlled boats are operated and a demonstration of how the boats are sailed on the lake, as well as the course layout. All residents, staff, and friends are invited to attend the ceremony. This will also be an opportunity for anyone wishing to try his or her hand at sailing. Shuttle transportation will be provided to Lake Charles. Races will be held every Monday morning at 10 AM throughout May and June. For more information, call John Ogaitis. See Resident Directory for contact information.